MED-HEALTH final conference will be an innovative and informative International Conference reflecting the direction of Public Health Management Studies while offering a wide range of diversions to participants of all backgrounds.creates a great platform to discuss current landscape and next steps for improving quality of public health studies in MED region. The conference will bring together leading academicians from partner country universities, master students, clinicians, public health professionals, health care specialists, health care workers, health economists, researchers, scientists, health workers, policy makers, social workers and other related professionals. The conference will gather renowned speakers from regional and EU partners, presentations, panel discussions, round table discussions, and valuable networking opportunities. A solid public health system constitutes a pillar of advanced societies, capable of providing their citizens with an enabling environment for development and smart and inclusive societies. The importance of quality education in health for inclusive societies, sustainable development and growth is stressed within the current Europe 2020 Strategy and its Flagships Initiatives. Employability of graduates and stronger relevance of universities’ educational programmes for their socio-­economic environment has moved high on the agenda of policy makers. Whereas in most European countries, HEIs have been developing policies and actions during the past decade, the situation in most European neighbouring countries is quite more precarious. In the Arab region, HEIs struggle to tackle the highest regional unemployment rate of the world, multifaceted health challenges and also a worrisome mismatch of the educational programmes with the socio-­‐economic needs. Integrating the contents and skills that really fit health challenges for smart and inclusive growth constitutes the very ground of this project. 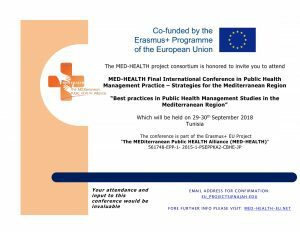 To explain the sustainability of the initiative and future plans of the MED-HEALTH ,Erasmus+ project and to promote the importance of its ongoing nature and its utilisation within the Mediterranean region. Furthermore, the Conference will provide a platform for the award ceremony for the Master students. To bring together leading academic scientists, researchers and research scholars to exchange and share their experiences and research results on all aspects of Public Health Management. It also provides a premier interdisciplinary platform for researchers, practitioners and educators to present and discuss the most recent innovations, trends, and concerns as well as practical challenges encountered and solutions adopted in the fields of Public Health Management. To discuss the role of public health in development at national, regional and international levels – sharing Experiences and exploring future perspectives. Creating Opportunity to experience the best public health practices in MED region. Empowering public health professionals to collaborate, innovate and help shape the future of public health landscape. Creating the largest platform in the MED region for innovative ideas and approaches to public health practice, policy and research that encourage further collaborations across multiple time zones. Interactive networking and knowledge exchange forum at the international level to identify, discuss and troubleshoot current public health issues across a range of disciplines and sectors. Supporting and nurturing the next generation of public health leaders. Engaging global and diverse voices, ideas, vision ,initiatives and actions of committed PH professionals. Strengthen and transform the global PH effort and influence decision making. Building multidisciplinary networks to promote public health at MED regional level. • Work-in-Progress Reports or Proposals for Future Research: Incomplete research or ideas for future research in order to initiate discussion. Proposals are accepted by Sep 15 2018 at latest. All submissions will be reviewed and acceptance or rejections is based on many factors including relevance to the conference themes. Notification on acceptance will be forwarded within 5 days after the submissions. Social determinants of health and inequity in low-middle- income countries. Health systems strengthening through human resource capacity building, effective health management and efficient financing. The conference invites participation from members of the academia to submit unpublished theoretical, empirical and scientific papers focusing on the following subtopics. Abstracts may include research results, case studies and/or presentations based on experiences gained through practice and/or observation and decision-making in public health management or any other form of proposal. Only abstracts of no more than 200 words and no less than 100 words will be accepted. Each submission must be related to at least one of the main topics of the conference. Abstracts must be unpublished and in English only. No other language will be accepted. see the “Abstract Template” attached below).